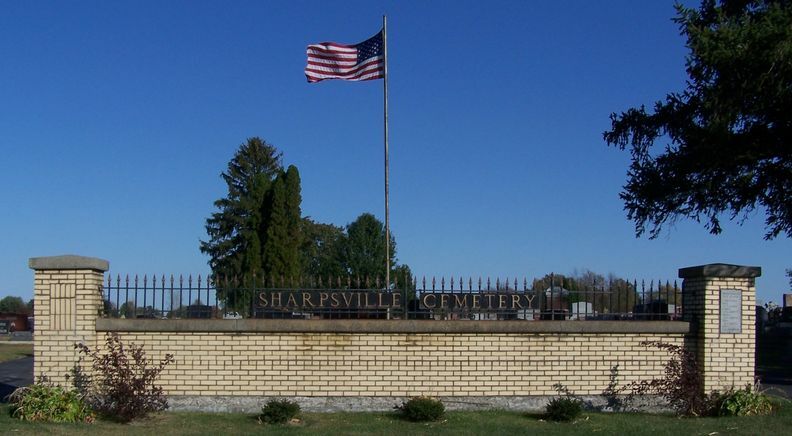 Located at the southeast corner of town, the Sharpsville Cemetery has been in existence for over 160 years. As late as the early 1950’s it was also known as Greenlawn Cemetery. The first person to be buried there in 1851, a victim of scarlet fever, was the four year old son of William Riggs. The first adult and perhaps the second burial was John McGee. William McGuire first held ownership of the land. The original entrance to the cemetery was located at the southwest corner of the oldest section (Sec. 1). Section 1 is a noticeable small hill with a large rectangular stepped terrace. When early settlers first began to use the hill for burials they found pits or “caves” that had been dug by Indians to store their hunting provisions. The settlers scooped dirt from around the edges to fill the holes thereby creating the sides of the terrace and slightly leveling the top of the hill. The cemetery is platted like any town. Original maps show additions and lots only. A separate and easier system of Section, Row, and Grave based on D.A.R. cemetery censuses is employed by the Cemetery Card Catalog located at the Tipton County Public Library. To agree with the card catalog in the original sections as much as possible, I designate a location using Section, Row and Stone. The newest and most active section (6E) uses consecutively numbered lots of six graves each. I simply use Section, Row and Lot. The cemetery map is a great help in this section. 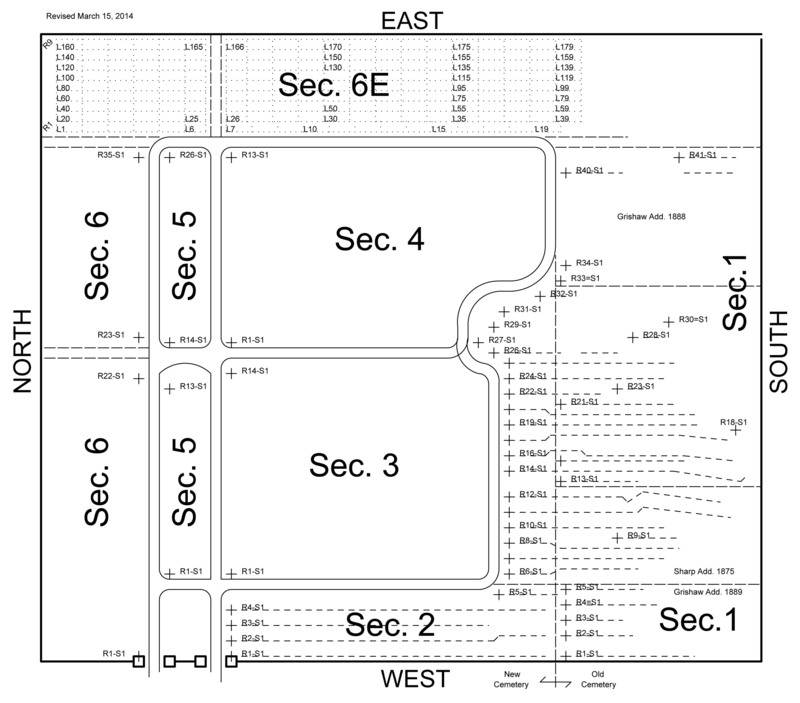 April 3, 2014 All sections have been diligently compared with cemetery documents and are now in agreement with same.